I love (and collect) radio public service announcements. The fact that, in 30 or 60 seconds, you can creatively convey an audible message aimed at encouraging or preventing something, has always fascinated me. Maybe it was the decades I spent doing radio, and the level of creativity I often heard on these messages, which made them so enduring to me. Who knows. So, I'm in a local thrift, when I spot this coloring book and record combo, from the Colorado Association of Realtors. Cool, a Colorado and a PSA score! Released in 1981, the association promoted safety tips to the kiddies with a coloring book and 7" 33rpm record of 10 tunes, complete with a coloring page for each tip (plus sheet music and lyrics). "Each year, many Coloradoans of all ages are injured or killed in preventable accidents, and many more are victims of crime." Geeze, if that doesn't put the fear of God in the kiddos, what will? Nothing a catchy little number can't resolve. The "Safety Through Songs" public service campaign was endorsed by Governor Richard Lamm, who penned the "Open Letter to Parents" on the inside (along with the state's Commissioner of Education and the Director of the Division of Highway Safety). 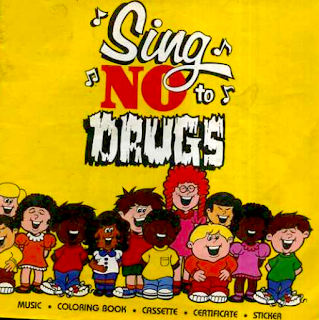 Credits show music and lyrics by California-based Janice Lipis Prall, who also went on to produce a similar PSA campaign, "Sing No to Drugs."